What animal kills more people than any other? If you've vacationed anywhere that requires those dizziness-inducing anti-malarials lately, you probably already know. 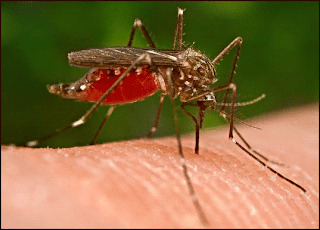 Pesky mosquitoes are far more than just pesky. For the million people each year who succumb to malaria, they're deadly. Writer Constance Casey cozies up to the tiny assassins today in an article in Slate, where she offers the gloomy stat that most deaths from malaria occur in children under 5. But she's also a mosquito apologist of sorts, pointing out that most mosquitoes don't bite people, and the detestable bugs are an important part of the food chain. Good points, but I'll still swat any potential bloodsuckers coming my way. When traveling to areas where malaria strikes, I'm always struck by how nonchalant survivors of the disease can be. A friend in Senegal brushed off my worries about what could happen to him when the rainy season started up and the mosquitoes came out in full force. "Oh yeah, I've had malaria lots of times," he told me, shrugging his shoulders like it was no big deal. I suppose that attitude makes sense considering that there's a limit to how much people in malaria-endemic areas can do to keep themselves safe, and living in a perpetual state of panic isn't going to help anything. One problem is that poor people are far more vulnerable to malaria. Their houses often lack screens to keep the bugs out, and they're far more likely to have to work outdoors where they're vulnerable to bites. The poor are also less likely to seek treatment in time because visits to the hospital can be prohibitively expensive. It's frustrating to think that humans have been battling this tiny opponent for centuries and the victory is not yet ours. In the spirit of knowing your enemy, give Casey's article a read. Previous Article Race, Gender and Income in the U.S.